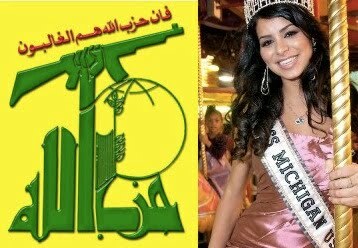 Rima Fakih, Miss Michigan USA, who will compete in Sunday Night’s pageant broadcast on NBC, is a Dearbornistan Shi’ite Muslim who is a supporter of Hezbollah. Her devout Muslim family comes from the Hezbollah stronghold of South Lebanon. Intelligence sources confirm that at least three of Fakih’s relatives are currently top officials in Hezbollah and that at least eight Fakih family members were Hezbollah terrorists killed by the Israelis in past Israel-Lebanese wars and incursions. Some of her family members were originally in Harakat Amal [the Shi'ite Amala militia], which is now essentially a part of Hezbollah. There’s a reason that even Al-Manar TV–Hezbollah’s official TV network–is high on Fakih in the Miss USA pageant. Be sure to read the rest of Debbie's commentary, here.